Earlier today I wrote about one of my AP Calculus BC students who wowed me with his solution to a particularly thorny algebraic problem. I referred to being outclassed by him as he saw something I did not think of AT ALL in the problem. This tale is about someone seeing something I saw – but something I did not expect my students to remember. This involved verifying the derivative of an awkward trig expression. Below is a snapshot I took and then I will try to detail the work and the conversation. I said out loud that my first instinct was that it would be nice to somehow get my Pythagorean identity in the numerator together. Boy it is nice to see both cosine squared and sine squared. Well, the hero of my first post shrugged and said he just attacked the quotient rule derivative here. Another student, named Samarth, had followed a path similar to the one I imagined. It is his work that I show above. He patiently talked the class through his thinking and his work and, in the process, showed that he had a strong memory of helpful trig definitions. This problem is a nasty one if you just lower your head and plow through. Samarth did not show interest in doing that, he wanted a more elegant touch to bring to play just as Connor had in the earlier post from today. In the same class as these two is another boy, named Daniel, who wowed me last week by applying the binomial theorem to a problem asking us to prove that numbers of the form 7^n – 1 are always multiples of 6. I have been in school for 9 days now and this class alone has knocked my socks off three times already. I have been having great conversations in my other classes as well and I will be highlighting some of those soon. It has been a pretty terrific start to the year and I am optimistic that more awesomeness lies ahead. 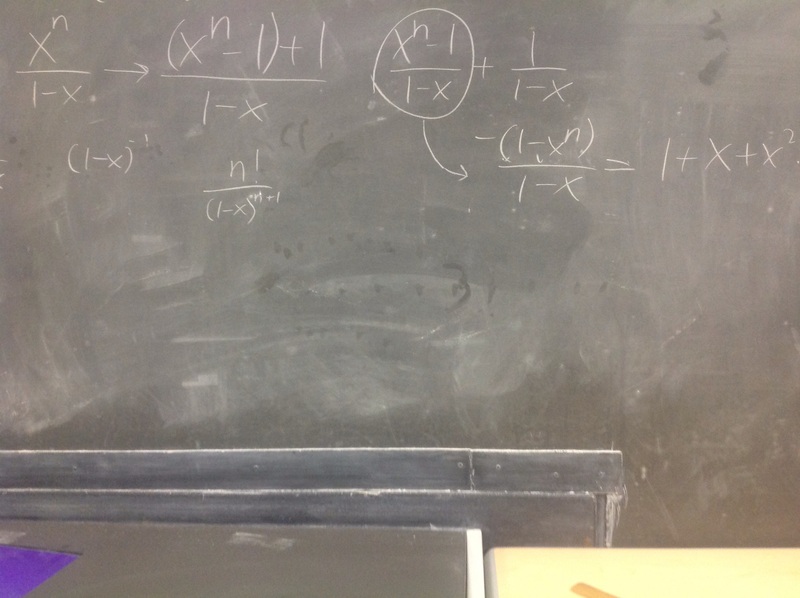 When n = 1 the derivative calculation was pretty straightforward and we ended up with 1/(1+-x)^2 asthe derivative. 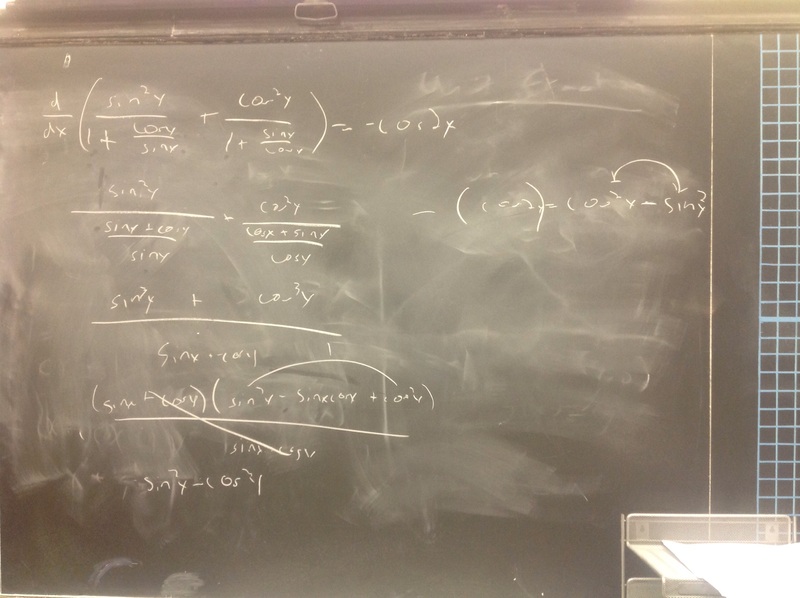 When n = 2 the work to find the second derivative was not as much fun, but it was doable. We ended up with 2/(1-x)^3 as its derivative. At this point, I wanted to predict that the derivative would be of the form n/(1-x)^n and call it a day. Unfortunately, this is not the correct answer and a quick check of the solutions manual confirmed this. This, sadly, is where my first period class ended its day. When my fourth period class came in, I was eager to start where I had left off and was prepared to wow my students with feats of Algebraic endurance by taking the third derivative of x^3/(1-x). One of my more talented students in the class is named Connor. He told me that when he got to that point in the problem on his homework that he knew that there had to be a enter way. He changed the numerator from x^n into x^n – 1 + 1. This allowed him to write the original fraction as a sum of fractions with the first fraction transforming almost magically. I took a snapshot of his work and here it is below. Connor recognized that the first fraction was now a geometric sum whose nth derivative would be zero. This is such a lovely example of what I hope our best students can/will do. Sure, he could have bulled his way through and seen the pattern emerge. Instead he insisted that there is a better way and he searched his mind to find a connection to something he had seen before. His classmates were taken aback, as was I. Once he rewrote the numerator, I thought of factoring and talked the students through that approach. As if that was not enough awesomeness for one class, I also had a student blow my mind with an approach to an ugly trig problem. Grading beckons me now, so I wil write again soon. This is a topic near and dear to my heart so I joined on and just posted my first item over there. You should head over to see some of the fantastic stuff happening already.